Capital One 360 Remote Deposits Now Available: Does Your Bank Offer A Remote Deposit App? Yesterday I heard the news that one of my favorite banks, Capital One 360 had just released a new remote deposit app for Iphone and Android devices. I quickly downloaded the app to take it for a spin. I've got a couple of accounts with Capital One, and knew that I would most likely be using the remote deposit functionality on a regular basis. As a blogger I still get a lot of checks from a wide range of clients, and I need to make deposits more than the average Joe. What better way to deposit them than by quickly snapping a couple of pictures with my smartphone? Today I thought I'd do a quick look at the Capital One 360 App and it's functionality, and then take a look at what other major banks currently offer some sort of remote deposits. Capital One 360 had announced that they were going to be releasing a remote deposit feature a while back when they were still with ING, but after they were acquired by Capital One, I'm assuming that the app got pushed to the back burner for a while. Well now it's been released, and it seems to work pretty well. After you login to the app with your account login information, you'll be given the option to view your accounts, transfer money, find an ATM or deposit a check. When you click on the “deposit” link, you'll be taken to the screen below, and prompted to “start”. The app will advise you that the maximum you can deposit is $3,000 per check, and that you should ensure that you have good lighting when you snap your pictures of the check. After you take and confirm the pictures of the front and back of the check, you'll be asked to confirm the amount of the check and which account you want it deposited in. When you're done you just hit “deposit” and your check will be deposited. Easy peasy! You can also take a picture of the front and back of your check with a regular digital camera or scanner, and upload them through your Capital One 360 account on the web if you don't have a smartphone. There is some fine print when you're doing the remote deposit as far as how long it takes for the money to hit your account, what you can deposit, etc. Capital One will only accept U.S. personal, business, and federal checks. Checks deposited into Capital One 360 Checking for less than $500 – first $200 is available the next business day, the remaining funds are available after 2 business days. Checks deposited into Capital One 360 Checking for greater than $500 – first $200 is available the next business day, the remaining funds are available after 5 business days. Any deposit into a Capital One 360 Savings or Kids Savings Account – funds are available after 5 business days. So deposits would typically be available between 2-5 business days. So make sure to get a good snap of the check, and make sure it is for less than $3,000. And don't forget to sign it! You'll receive an email notifying you when your remote deposit has been accepted. Until you receive it, hang onto that check – just in case! What Other Banks Offer Remote Deposits? 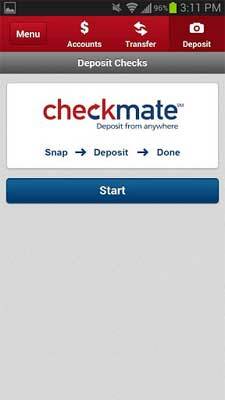 Capital One 360: Capital One just released remote deposits via their app and by scanning in checks via their site. Chase Bank: The Chase Mobile app allows you to deposit checks. PNC Bank: Their Virtual Wallet app will allow you to deposit checks. Charles Schwab: The Schwab Mobile Deposit app allows for remote check deposits. USAA Bank: USAA Deposit@Home app allows remote deposits. What If Your Bank Doesn't Offer Remote Deposit? If your bank doesn't currently offer remote deposits, there is something else you can do. If you have a PayPal account, you can download the PayPal app which also has a remote deposit feature as well. Just make sure your bank account is linked to your PayPal account (which it probably already is), scan the check in and then transfer the money to your bank account when it becomes available. Doing it this way will mean a delay of 5-10 days most likely, but if it's your only option, it is a decent option. Do you currently use remote deposit with your bank account? Have you considered signing up for an account because of this feature? Tell us your thoughts. What Are You Doing To Make Your Money Dreams A Reality? Many of us have money dreams. Often, these dreams focus on some point in the future, when you have more money. We think about the things that we'll do when we have more money: Go on vacation, set up a charitable foundation, get rid of debt, pay off the mortgage, or accomplish some other feat. Unfortunately, while dreaming about what we'll do when we have more money, we often overlook the intervening step of planning to make those dreams a reality. We dream of a financially sound future, but we neglect to make any provisions for actually getting there. As a result, having more money in the future remains a dream — and the future we dream about is never realized. What Money Realities Do You Face? First of all, you need to recognize where you are in terms of money. Honestly look at the money realities that you face. Look into the future and consider what's next. Just as you need to consider the financial implications of marriage, having children, and other milestones, you also need to consider your current situation. Figure out how where you are right now relates to where you want to be. Next, you need to make a list of the steps that you need to take in order to get from where you are to where you want to be. This is where many of us trip and fall. We find ourselves unhappy with the current situation, and dream of what it would be like to have more money. We use phrases like “When I have more money” and “When I get that promotion” to describe what we hope will be a profitable future. But these types of wishes skip over the realities that we face now, and the actions that need to be taken in order to achieve your financial goals. Once you know where you are, and what needs to happen in order for you to achieve your money dreams, it's time to create a plan. You can look for ways to develop multiple streams of income, you can improve your skills so that you qualify for better pay, and you can also find ways to cut the unimportant spending from your life and save more money. There are a number of ways that you can work toward your goals, and they differ according to your situation and your preferred outcome. The common factor, though, is that you have to take action. You need to consciously set out to achieve your financial goals in a way that renders them achievable. While you might have set backs, breaking down your goals into achievable financial resolutions that you can work on each year can help. Indeed, creating a plan for your money is one of the best ways to help you finally achieve those dreams. Eventually, if you create and stick to a plan, you won't be saying, “When I have the money…” anymore. Instead, you will have the money. But it doesn't just happen, and you can't get to that point on mere wishes. Are You Letting Your Kids Ruin Your Retirement? Most of us like to help others — especially if those others are our children. I know that I like to help my son. I like going places that I think he'd enjoy, and my husband thinks it's fun to shop for his Christmas presents, keeping an eye out for things he'd like. And, of course, if my son were in trouble, I'd want to help him out. But what can be really difficult is to figure out where the line is when it comes to helping or enabling. You also have to know when to say no when your own financial future is at stake. Are You Putting Your Own Finances at Risk? In many cases, helping your kids out occasionally with their finances won't bankrupt you, or even put your retirement at risk. Unfortunately, though, a pattern of poor financial decisions from your children can result in a situation that eventually puts your finances at risk. Even some items of financial responsibility, such as paying for college, can leave your retirement plans in ruins. It's popular to say that there are loans for college, but there aren't loans for retirement. And, in truth, there are other loans available for your children to use if they are in a tight spot and you can't help without putting your retirement at risk. And they'll have more time to repay those loans — as opposed to the situation you might find yourself in if your money is no longer working on your behalf. Retaining financial responsibility for your grown and capable children can quickly become a double-edged sword. Your nest egg dwindles, while your children continue to think that they can make poor financial decisions while you take on all the risk. You don't want your declining years marred by inadequate funds because you have spent them all on trying to get your kids back on track. And, if your kids haven't learned anything because you've bailed them out time and again, they won't even be in a position to take care of you financially in order to repay your own efforts. One of the best remedies to the problem of having your retirement ruined by your children's financial behaviors is one of prevention. Teach good financial habits in the beginning. Encourage financial literacy early on, and focus on helping them learn to take responsibility for their own money. Set boundaries from the beginning, making it clear what you will help them with — and the conditions for doing so. My mother has always had this rule: If you plan to live at home after you're 18, you'd better have a job, or getting an education that will help you acquire a marketable skill. She also expects anyone living with her to spend their money on paying down debt, and saving up for the future. And you'd better be ready to help out around the house. Consider what you expect your children to do with money, and then convey those expectations to them. Teach them to manage their money wisely, and there will be a smaller likelihood that they will come looking for your nest egg.